I'm not quite sure why, but for some reason I always seem to end up getting several new girls on my caseload at the end of every year. 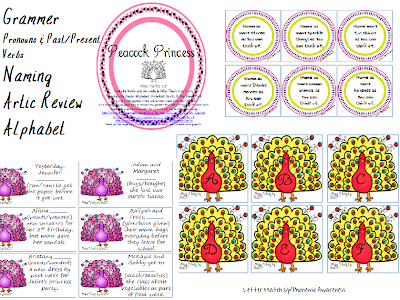 The Peacock Princess activity is a mixture of several different targets that adds much needed variety to all of the more masculine-themed products. It includes alphabet matching (upper & lower case letters with diagraphs included)/phonemic awareness if you chose to print out more than one set of the letters; past & present tense verb agreement; pronouns with a sorting mat; naming; and a few cards for articulation review. I love that this is still one of my go-to materials even though I created it several years ago. You can head on over to my blog to learn more about this activity. Simply click on the picture below!